View mismatches or modeling errors for Libraries or IP can seriously delay an IC design project. Because of the still increasing number of different views required tsupport a state of the art deep submicron design flow, as well as the complexity of the views themselves, Library and IP integrity checking has become a mandatory step before the actual design can start. Crossfire helps CAD teams and IC designers in performing integrity validation for Libraries and IP. Crossfire makes sure that the information represented in the various views is consistent across the views and does not contain anomalies originating from e.g. failing characterization scripts. Do all schematic pins occur as terminals in layout and abstract views? Are all delay arcs from Liberty present in Verilog? Are CCS peak currents increasing with capacitance? Are cell delays increasing with increasing temperature and decreasing supply voltage? Can all pins be routed in first-metal? Is a reset pin active-low in SPICE, Verilog, and .lib files? Does the LEF abstract correctly cover the layout view? 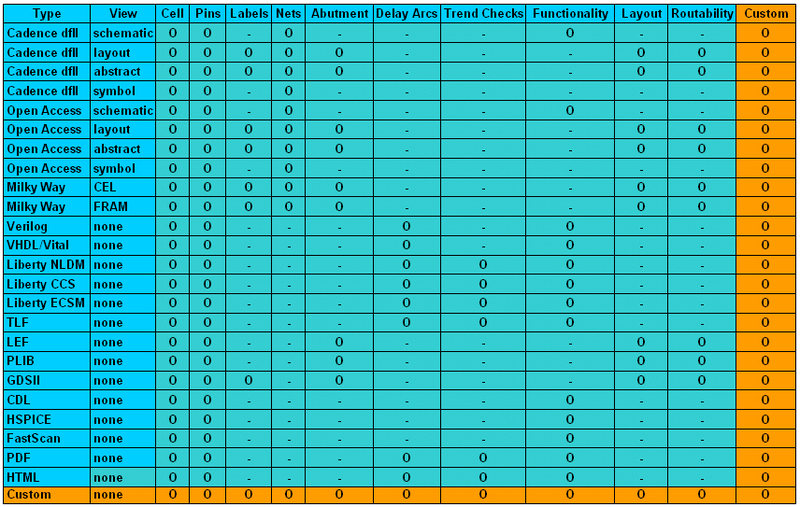 Tcheck on presence and contents of cell- or pin-properties? Verify that certain pins are located correctly within a cell? Crossfire offers a low usage threshold for QA checks by an elaborate user interface which allows for all checks tbe graphically controlled. For regression testing purposes, batch execution is supported. Issues reported by Crossfire all come with extensive explanation and are immediately highlighted in the source-data. This directs users directly tthe root cause of the error.